I’d like to give a special thanks to the extremely talented Karen Maher from Karen Maher Make Up for lending her expert tips and advice here. She has gone above and beyond to give you the best advice possible which will get you primed for your wedding day. Firstly, it’s never too early or too late to start a good skin care regimen but even more so it is vital to get into a good routine in the months leading up to your wedding day or big occasion. Some of these tips may even help the men. For healthy, glowing skin it is essential to start with a regular daily routine and simply making the time for yourself. This is one you will already know, but I really cannot stress the importance of drinking plenty of water on a daily basis. Try to drink at least 2 litres of water every day. When your skin is hydrated it instantly looks more radiant, youthful and brighter. This is especially important during the colder, harsher months when we are exposed to open fires, central heating, air conditioning, etc. which all play a part in dehydrating our skin. When you start drinking water more frequently throughout the day you will instantly notice an improvement in the appearance of your skin. Here is a step by step guide to the perfect skincare routine as recommended by Karen and some affordable and easy to find products which have been tried and tested by her. The first step to beautiful skin is effective cleansing. It is so important to cleanse every morning and evening regardless of whether you are wearing make up or not. Your skin is exposed to harsh elements such as air pollution all day long which need to be removed at night before applying any creams. If you wear make up on a daily basis this is very important, never ever remove make up with make up wipes, these can be very harsh on your skin and very dehydrating. Karen recommends using a product like Garnier Micellar Oil-Infused Water to remove makeup first, followed by a deep cleanse. This product does exactly what it says it will do, efficiently cleanses away all make up, even the blackest, most waterproof makeup, while being gentle to the skin and it leaves skin feeling nourished. It is suitable for both dry & sensitive skin. To use, apply to a wet cotton pad and wipe across the eyes, and face. No need to rinse. If you are not wearing any make up then it is effective just to do a cleanse with the products below. However, if you are wearing make up, it is important to remove the top layer as outlined above and then use a cleanser afterwards for a deep clean and to ensure your skin is properly clean, this will help to prevent breakouts, blocked pores and impurities. No7 Soft & Soothed Gentle Cleanser, this Cleanser is ideal for Normal to Dry Skin. It cleans, comforts and hydrates your skin, it works in harmony with your skin to leave your face clean, comfortable and radiant. No7 Beautiful Skin Melting Gel Cleanser, this product is Specially formulated to effectively clear away dirt and impurities. No7 Beautiful Skin Melting Gel Cleanser leaves skin feeling as soft and supple. Apply to damp skin, work into your skin with finger tips and rinse with water for a deep cleanse. Facial cleansing washes are ideal for acne prone or oily skin. Clarisonic Mia 2, this product is not essential and it is rather expensive. Karen says that it cleanses 6 times better than manual cleansing, because it cleanses so thoroughly skin care products absorb better. La Roche-Posay Thermal Spring Water is ideal especially during the hot summer months to cool your skin down. This is lightly sprayed onto clean skin after cleansing and it acts as a toner. It can also be used throughout the day to hydrate skin. Eve Taylor Soothing Toner is a fine mist of water with essential oils to help freshen and soothe the skin, This toner has a Hydrating and soothing formula which perfectly prepares the skin for moisturising. Using a moisturiser every morning & evening as part of your skin care routine is key to how your skin will look and feel. The range of moisturisers available is very broad, so it really depends on your skin type and the type of product you like as to which one will suit your skin & needs. With the use of a good moisturiser your skin can go from feeling dry & harsh to soft and supple in an instant. 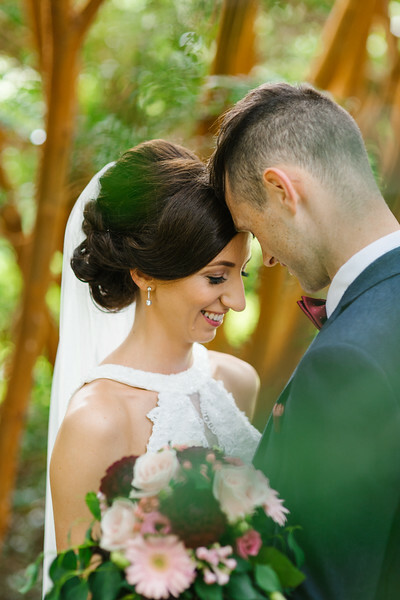 Trust me on this one, the best way to take the stress, rush and panic out of your wedding morning is to have your hair stylist & make up artist come to you on the morning of your wedding, the suppliers will ensure a lovely calm and fun atmosphere in the comfort of your own surroundings for the morning. 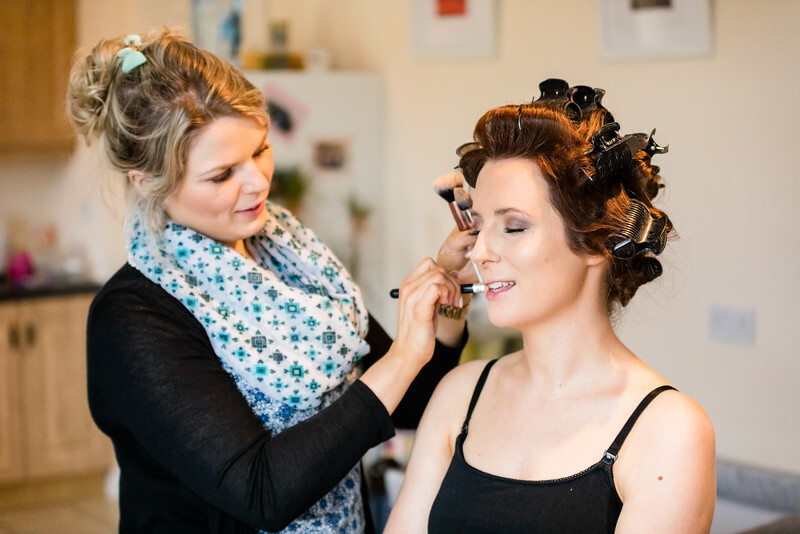 It means you will have a little more time to do the things that need to be done in between hair & make up etc and it provides a more relaxed, comfortable setting for all involved. The majority of Hair stylists & Make up artists will provide a call out service for bridal parties. The day before your wedding is your time to get organised for the actual day itself. 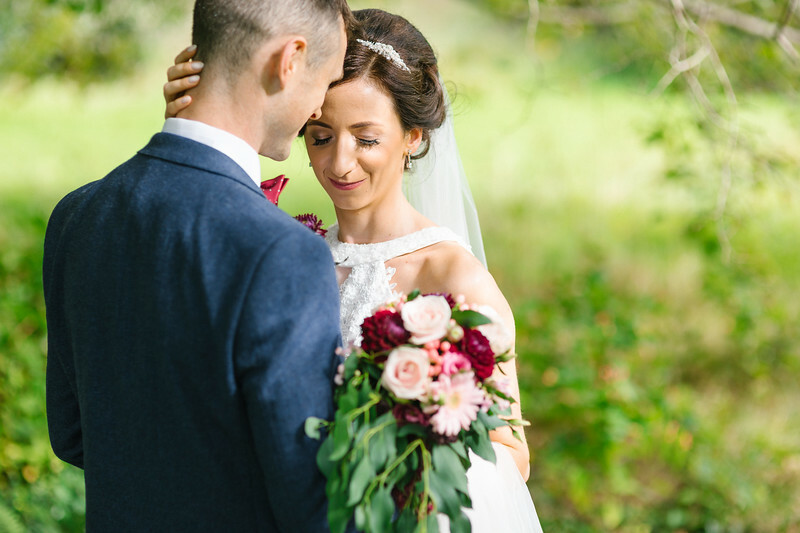 You will find the week of your wedding is generally a busy one, with lots to do and appointments to keep etc., so preparation and planning really is key. Make lists and tick them off as each task is completed, you will have so much going through your head that it can be easy to forget something. Perfume, jewellery, underwear, wedding shoes, lipstick, garter, sentimental items, veil, engagement ring, wedding rings, headpiece, handbag, overnight hotel bag. Plasters, comfortable shoes for dancing, baby wipes, your wedding perfume, deodorant, sewing kit with white thread, nappy pins(these are useful when putting up your wedding dress train for the evening reception), scissors, double sided lingerie tape, hairspray, hair clips, shampoo & conditioner, lip balm, your wedding dress bag to carry your dress home the following day, your morning after outfit. It is a good idea to allocate someone to bring this into the hotel for you on your wedding day. To be extra prepared and organised, have all of your wedding day items set up and together in your getting ready room. Tick off the checklist to make sure you don’t forget anything. This will save time when it comes to getting ready as everything is ready to go and in the one place, it also makes for a really pretty photo opportunity for your photographer. It is a good idea to also also have the outfits and items set up & ready for the bridesmaids & mother of the bride, sometimes there can be a last minute panic when a pair of earrings or tights, etc., cannot be found at the last minute. Baby wipes, deodorant, tissues, scissors, safety pins, double sided lingerie tape(ideal if a strap is slipping). The day before your wedding, remove the store labels from each clothing item including your wedding dress, veil, jewellery, bridesmaid dresses etc. Another job to have done in advance and there wont be a last minute dash for a scissors. It is a good idea to have a timetable/schedule for the morning to include showers, car ribbon duty, food collection, etc., so that everyone knows where they need to be and at what time. 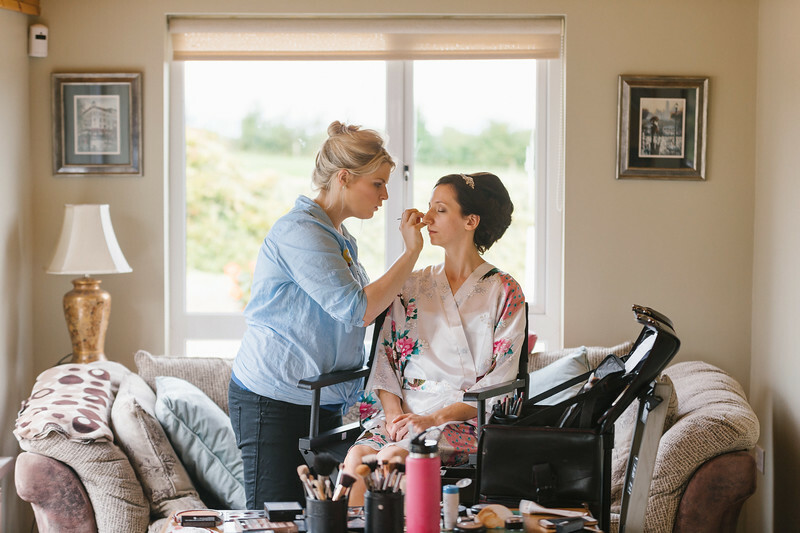 As a make up artist I generally give my brides a rough make up timeline so that they can be prepared and plan out the morning for the ladies. It is a good idea to include dads & brothers in this who sometimes forget to have showers or shave, etc., until the very last minute! Another big question I am often asked is when should the bridal party get dressed. I always suggest chatting to your photographer about this but generally I would aim to be getting into your dresses with 1 hour to go, it will take longer than you expect to get all the ladies dressed, jewellery on, last minute checks, etc. It is nice to be all ready, have time for photos and also a few minutes of downtime to enjoy a glass of bubbly before the wedding ceremony. 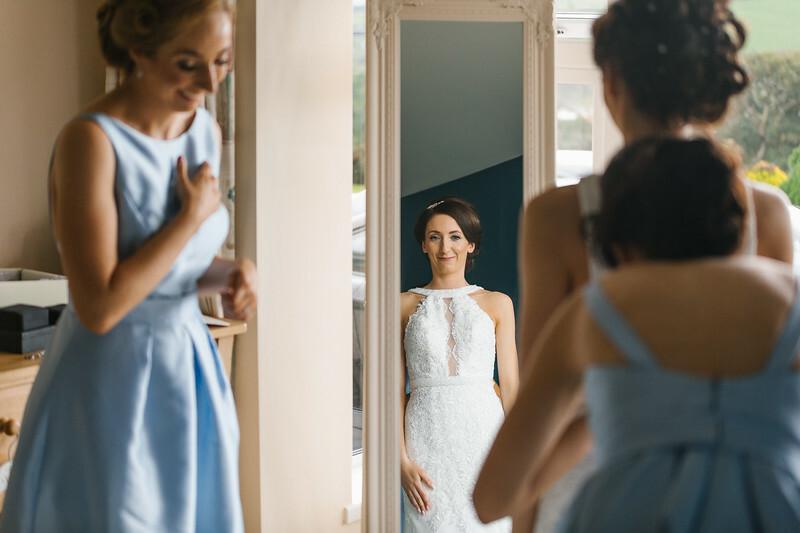 Another little tip for the bride, on your wedding morning remember to take a moment to look at yourself in the mirror, you will be transformed into a beautiful bride and it is important to take in the moment after all your planning & preparations it is lovely to savour all the feelings & excitement of finally seeing your bridal look all come together. It may seem obvious but it can be surprising on your wedding morning how the last thing you will think of is eating, especially as your tummy may feel a bit funny with a mix of butterflies, nerves and excitement. Eat a substantial breakfast when you first wake, something that you are used to and then something again around 11.30am before you get dressed. It is a long time until your main meal is served that evening and you don’t want to get light headed, tired or dizzy. It is a good idea to bring some sandwiches, bananas or something clean and easy to eat for the car journey to your wedding reception. Trust me I speak from experience of being a part of bridal parties on this one! Don’t be afraid to delegate. Most men are a bit lost on the wedding morning in a house full of women getting pampered so they love having something to do. Allocate them useful jobs like putting on car ribbons, breakfast collection, flower collection, putting up directional signs, dropping things to the church, etc. Organise all your suppliers payments the week of the wedding, don’t forget to deduct your deposits from the final payment. Allocate trustworthy people to pay each supplier on the day. Where possible, have some of your wedding suppliers paid in advance of the day. On our wedding day we allocated this job between my brothers, and the grooms brothers so that one person wasn’t carrying all the envelopes. Sometimes this is beyond your control but try to keep the house as stress free as possible, try to avoid any unnecessary visitors. 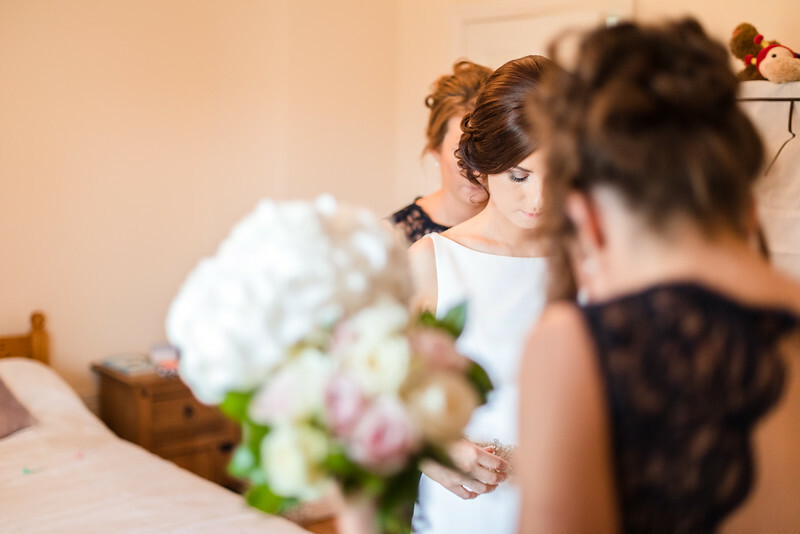 Sometimes relations, neighbours, friends, etc., call in at the last minute on their way to the church, this can be the busiest time of the morning when everyone is trying to get dressed and organised to leave for the ceremony. At this time the house can get quite hectic so limit it as much as possible to close family or anyone that may be needed. There will be lots of time for chat and catch ups with everyone after the wedding ceremony. If you intend on giving your bridesmaids or any family members a gift, card etc on the morning of the wedding I would suggest doing this early on in the morning rather than nearer the ceremony time. As the morning progresses it may be forgotten and it is only at the last minute when the bridesmaids are missing earrings(as they are the present) that it is remembered. It is nice for the bride to be able to enjoy and share in such a special moment and so that the receiver can appreciate the thought and effort that the couple have put in. Get all the men to try on their suits the day before the wedding day. It is all too common for a mishap with the suits to take place, the size, length etc. To avoid any last minute dash back into the shop on the morning of the wedding do a check of all the suits the day before. Start your mass booklet information well in advance. Choosing readings, songs and pieces for your ceremony may take longer than you expect. Try to choose songs that you both love and enjoy listening to. They will become a very fond memory every time you hear them afterwards. Try not to leave the table plan until a few days before the wedding. This may take longer than anticipated. A few weeks before the big day, start a rough draft of the plan. As your rsvps are coming in you can erase the no’s from the plan. A couple of days before the wedding you can the complete the final plan. It will be easier to have the main bulk of the job done in advance. Do as much as you can in the months leading up to the big day. Try not to get to caught up in the small stuff. Email all your wedding suppliers to confirm wedding times, directions, any details they require, confirm they have the right venue, day and date, etc., about 2 weeks before. This will give you peace of mind on the day that all of your suppliers will be there. Don’t stress or worry about the weather. It is beyond your control and something you can’t plan. Have some umbrellas as back up, just in case, and if it does rain, don’t dwell on it. 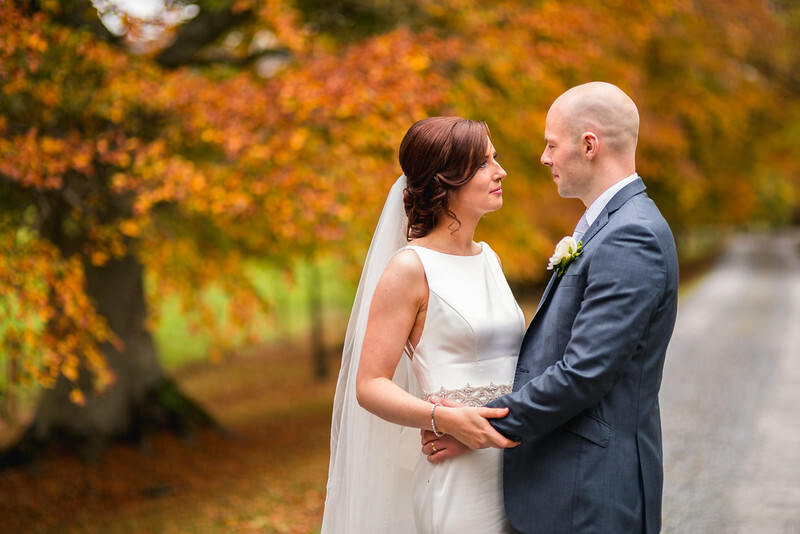 Sun, cloud, rain, hail, sleet or snow, your wedding day will be one of the best & happiest days of your lives. I hope you will find this somewhat helpful for your wedding planning. I'd like to give a massive Thank You again to Karen for offering her insights and professional advice!